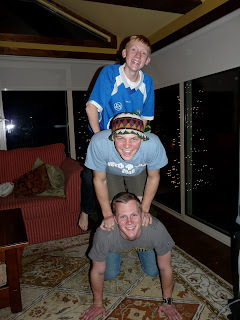 I have a blog post that is nearly ready to publish but on this, the last day before my oldest OS goes back to West Point, I have chosen to pre–empt my scheduled post. The one thing that Nathan said he wanted for Christmas was an Iron Gym. We are such amazing parents, we not only got Nate one, but another one for the middle OS Aaron. Yes, it’s true! After dinner last night, (and I must share with you the really awesome thing we have been doing as a family), the OS cleaned the kitchen and then scurried upstairs. The next thing I know Aaron bounds downstairs in a skinny t-shirt and a crazy wig. He had applied camo paint all over his face and created slightly lifelike facial hair. Aaron has a flair for the dramatic which is an understatement. But this time Aaron had enlisted the help of his bros. They were going to make a video about the Iron Gym. As I was sewing aprons downstairs, the Hubs and I could hear the chatter of our OS rehearsing their own Iron Gym commercial. See for yourself and then you’ll know just one more reason why I am going to miss my big boy and all the wacky things the three of them do together. ← All I want for Christmas is WATER! ha ha! That's great! Happy new year! Hey I'd like to thank you for such a terrific quality forum! Was thinking this would be a nice way to introduce myself!Sincerely,Hilary Driscollif you're ever bored check out my site! [url=http://www.partyopedia.com/articles/fiesta-party-supplies.html]fiesta Party Supplies[/url].